Catherine is the founder of Canine Health Concern (CHC), which spearheads research and education by and for dog lovers to promote positive canine health. She is author of the books What Vets Don't Tell You About Vaccines, and Shock To The System, the writer and presenter of CHC DVD 'In Search of the Truth About Dogs' which won the Dog Writer's Association of America Award for best DVD of 2008, is a guest columnist for Dogs Today magazine, and has helped to popularise natural feeding and complementary healthcare options among dog lovers on a worldwide basis. She learnt Emotional Freedom Technique in 1998 and is qualified as a practitioner and teacher under the Association for the Advancement of Meridian Energy Techniques (AAMET). 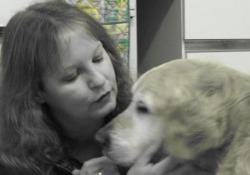 Catherine is also an ACT (Animal Communication Training) examiner, and a qualified Reiki practitioner.